The next Master Watershed Stewards training will be announced in Winter 2019! Montgomery County Conservation District has partnered with Penn State Extension to coordinate the Master Watershed Stewards program. Master Watershed Stewards is a volunteer program led by Penn State Extension with the goal of building capacity for watershed protection and restoration by training volunteers who can make an impact. Master Watershed Stewards receive extensive training on water resource stewardship and then put their expertise to use helping and leading projects to protect and enhance water quality. Master Watershed Stewards learning how to teach “Watersheds 101” from award-winning environmental educator, Trudy Phillips. 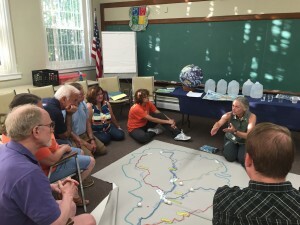 In Pennsylvania, the program was started in Lehigh and Northampton Counties, and then Montgomery County stepped up to help spread the program, graduating 11 Master Watershed Stewards in 2014. Our stewards are now aiding local watershed organizations, municipal Environmental Advisory Councils, and others with restoration projects, creek monitoring, and education programs. The program is now being offered in many counties throughout southeast PA and the rest of the state, with the goal of going state-wide! Click here to read the 2016 Annual Report and see what we have accomplished.